Research: Systems & Computational Neuroscience, Theoretical Biophysics, Mathematical Biology, Mathematical Neuroscience. Order and Disorder in Visual Cortex: Spontaneous Symmetry Breaking and Statistical Mechanics of Pattern Formation in Vector Models of Cortical Development. Peter J. Thomas, 2000, Ph.D. thesis. A Nonlinear Response Model for Single Nucleotide Polymorphism Detection Assays. Drew P. Kouri, 2008, MS thesis. Diffusion Mediated Signaling: Information Capacity and Coarse Grained Representations. Matthew Garvey, 2008, MS thesis. Food for Thought: When Information Optimization Fails to Optimze Utility. Edward K. Agarwala, 2009, MS thesis. Amplification and Accuracy in a Stochastic 2D Gradient Sensing Pathway Model. Suparat Chuechote, 2010, MS thesis. 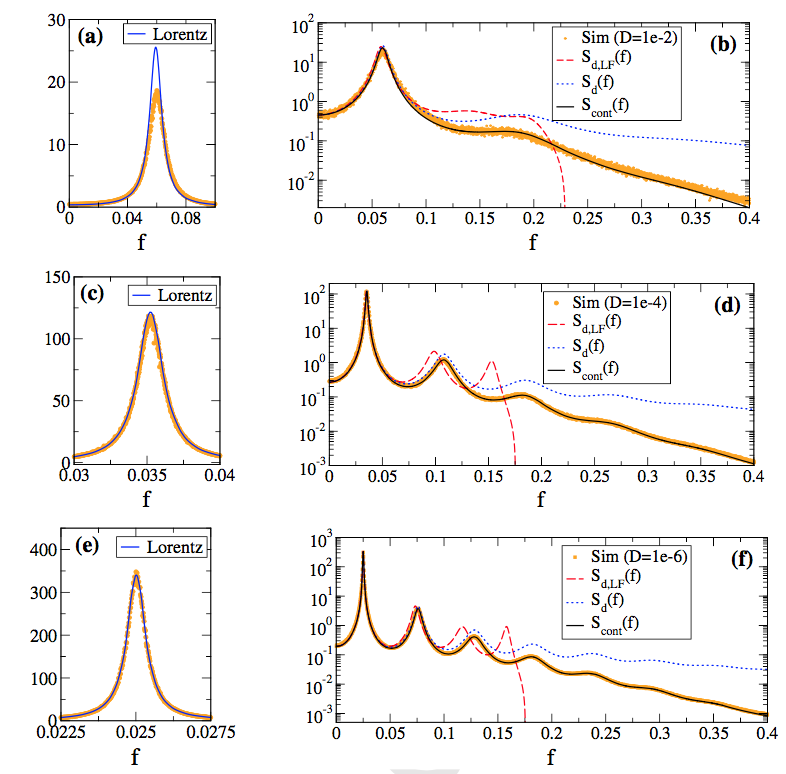 Infinitesimal Phase Response Curves for Piecewise Smooth Dynamical Systems. Youngmin Park, 2013, MS thesis. Channel Noise And Firing Irregularity In Hybrid Markov Models Of The Morris-Lecar Neuron. Casey A. Bennett, 2016, MS thesis. Dimension Reduction for Stochastic Oscillators: Investigating Competing Generalizations of Phase and Isochrons. Alexander Cao, 2017, MS thesis. Information Theoretic Analysis of a Biological Signal Transduction System. Shu Wang, 2018, MS thesis. Lecture on Stochastic Limit Cycles for Conductance-Based Neural Models: A Master Equation Approach from the 2012 SIAM Life Sciences Meeting. BIRS Workshop on Stochastic Network Models of Neocortex (a Festschrift for Jack Cowan) (Lead Organizer). Lecture on Asymptotic Phase for Stochastic Oscillators. See also the Cowan Fest web site. The Journal of Mathematical Neuroscience is hosting a special issue in honor of Jack Cowan. BIRS Workshop on Biological and Bio-Inspired Information Theory (Co-organizer). Lecture on Signal Transduction and Information Theory. BIRS Workshop on Particle-Based Stochastic Reaction-Diffusion Models in Biology (Participant). Lecture on Stochastic Shielding: a Novel Approach to Simplifying Random Processes on Graphs. Workshop on Stochastic Neural Dynamics at the 2015 Computational Neuroscience Meeting in Prague. SIAM Conference on the Life Sciences, July 11-14, 2016, Boston, Mass. International Focus Workshop on Principles of Biological and Robotic Navigation, 29 August - 31 August 2016, Dresden, Germany. Claude Shannon Centenary celebration by the IEEE's Information Theory Society, including a special issue of the IEEE Transactions on Molecular, Biological, and Multi-scale Communications. Brain Dynamics and Statistics: Simulation versus Data (BIRS workshop), 27 February, 2017, Banff, Canada. Here is my talk Noise in the Brain: Statistical and Dynamical Perspectives. SIAM 2017 Applied Dynamical Systems (Snowbird) Minisyposium 1 ``Isochrons and Isostables". Here is my talk DS17 - MS1-3: Defining the "Phase" of a Stochastic Oscillator, May 21, 2017. MBI Fall 2017 Emphasis Semester on Control in Biology and Medicine. Workshop 1: Control and Modulation of Neuronal and Motor Systems (Sep 10-15, 2017). Workshop 2: Control of Cellular and Molecular Systems (Sep 30-Oct 6, 2017). Workshop 3: Control of Disease: Personalized Medicine across Heterogeneous Populations (Oct 29-Nov 3, 2017). Workshop 4: Sensori-motor Control of Animals and Robots (Nov 13-17, 2017). Conference celebrating Jack Cowanâ€™s 50 years at the University of Chicago (invited speaker). May 11, 2018. BIRS Workshop on Mathematical Approaches to Cell-Cell Communication and Collective Behaviours (Participant), July 8-13, 2018. (Fall 2018) MATH 435: Ordinary Differential Equations. Meets MWF 9:30-10:20 in (TBD). Draft Syllabus. (Fall 2018) MATH 380: Introduction to Probability. Meets MWF 10:35-11:25 in (TBD). Office Hours: (Fall 2018) TBD. And by appointment. Arterial oxygen homeostasis under closed-loop respiratory control, see Diekman et al 2017. Semianalytic approximations of the power spectrum of a stochastic heteroclinic oscillator, see Giner-Baldo et al 2017. Robustness of a motor pattern to increase in applied load, see Lyttle et al 2016. Deterministic and stochastic isochrons of a planar conductance based model, see Thomas and Lindner, 2014. Morris-Lecar model with discrete sodium and calcium channels, Anderson et al 2015. Effects of phase offset on response to a two-frequency current stimulus in a cortical cell recorded in vitro. Top: stimulus. Bottom: spike train responses (time vs phase). From Thomas et al 2003. Ion channel fluctuations, irregular synaptic barrages and other sources of ``noise'' limit the precision and reliability with which nerve cells produce action potentials. But highly precise and reliable patterns of spike times have been observed experimentally both in vitro and in vivo. What is the origin and functional significance of precise temporal patterns in the ``neural code''? Problems of current interest include (1) Relation of noise spectrum and intensity and input shape and amplitude to spike time precision in single cell models (integrate-and-fire, conductance based models). (2) Genericity of spike time convergence in simple deterministic neural oscillator models. (3) Analysis of feedback control mechanisms exploiting heteroclinic structure in neural dynamics, in comparison with experimental data from the sea hare Aplysia (collaboration with the Chiel laboratory). (4) Development of novel statistical techniques for identifying patterns in multiunit recordings in both Aplysia and in mammalian hippocampus. (5) Reexamination of the concept of "asymptotic phase" for stochastic oscillators, in collaboration with Prof. Dr. Benjamin Lindner at the Bernstein Center for Computational Neuroscience, Humboldt University, Berlin. Youngmin Park, Kendrick M. Shaw, Hillel J. Chiel, and Peter J. Thomas. ``The Infinitesimal Phase Response Curves of Oscillators in Piecewise Smooth Dynamical Systems". Accepted at European Journal of Applied Mathematics, special issue on analysis and applications of nonsmooth dynamics. arxiv link. Simulations available on Github. Casey O. Diekman, Peter J. Thomas, and Christopher G. Wilson. ``Eupnea, tachypnea, and autoresuscitation in a closed-loop respiratory control model." Journal of Neurophysiology (2017). PDF. Jordi Giner-Baldo, Peter J. Thomas, and Benjamin Lindner. ``Power Spectrum of a Noisy System Close to a Heteroclinic Orbit". Journal of Statistical Physics (2017). PDF. David N. Lyttle, Jeff P. Gill, Kendrick M. Shaw, Peter J. Thomas, and Hillel J. Chiel. ``Robustness, flexibility, and sensitivity in a multifunctional motor control model.'' Biological Cybernetics (2016) Dec. 21: 1-23. PDF. David F. Anderson, Bard Ermentrout, and Peter J. Thomas, ``Stochastic Representations of Ion Channel Kinetics and Exact Stochastic Simulation of Neuronal Dynamics'', Journal of Computational Neuroscience, 38(1): 67-82 (Jan. 2015). PDF. Peter J. Thomas and Benjamin Lindner, ``Asymptotic Phase for Stochastic Oscillators", Physical Review Letters, 113(25), 2014: 254101. PDF. Kendrick M. Shaw, David N. Lyttle, Jeffrey P. Gill, Miranda J. Cullins, Jeffrey M. Mc- Manus, Hui Lu, Peter J. Thomas, and Hillel J. Chiel. ``The Significance of Dynamical Architecture for Adaptive Responses to Mechanical Loads During Rhythmic Behavior'', Journal of Computational Neuroscience, appeared online 04 Sep. 2014. PDF. 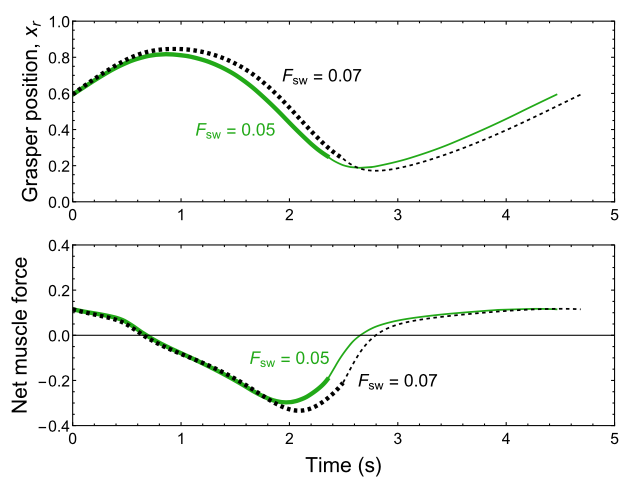 J. Vincent Toups, Jean-Marc Fellous, Peter J. Thomas, Terrence J. Sejnowski, Paul H. Tiesinga, ``Multiple Spike Time Patterns Occur at Bifurcation Points of Membrane Potential Dynamics.'' PLoS Computational Biology 8(10):e1002615 (2012). PDF. 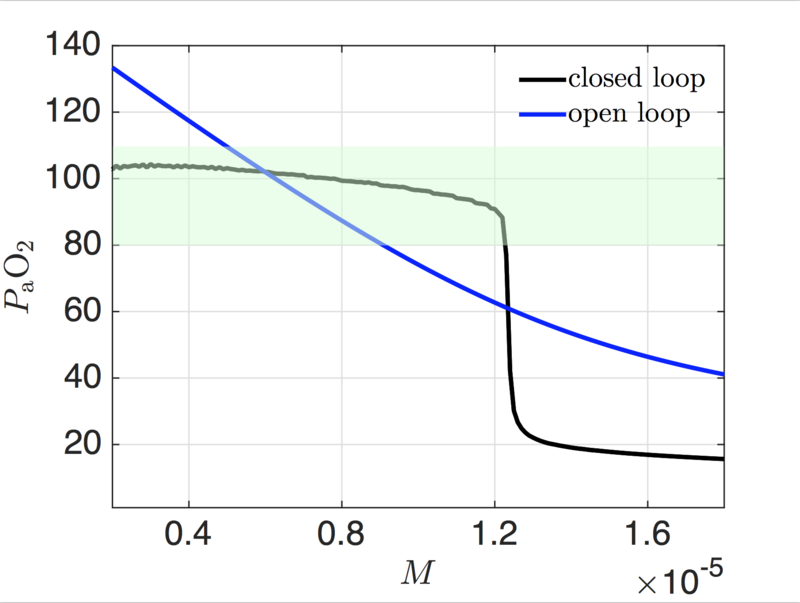 Kendrick M. Shaw, Young-Min Park*, Hillel J. Chiel and Peter J. Thomas, ``Phase Resetting in an Asymptotically Phaseless System: On the Phase Response of Limit Cycles Verging on a Heteroclinic Orbit.'' 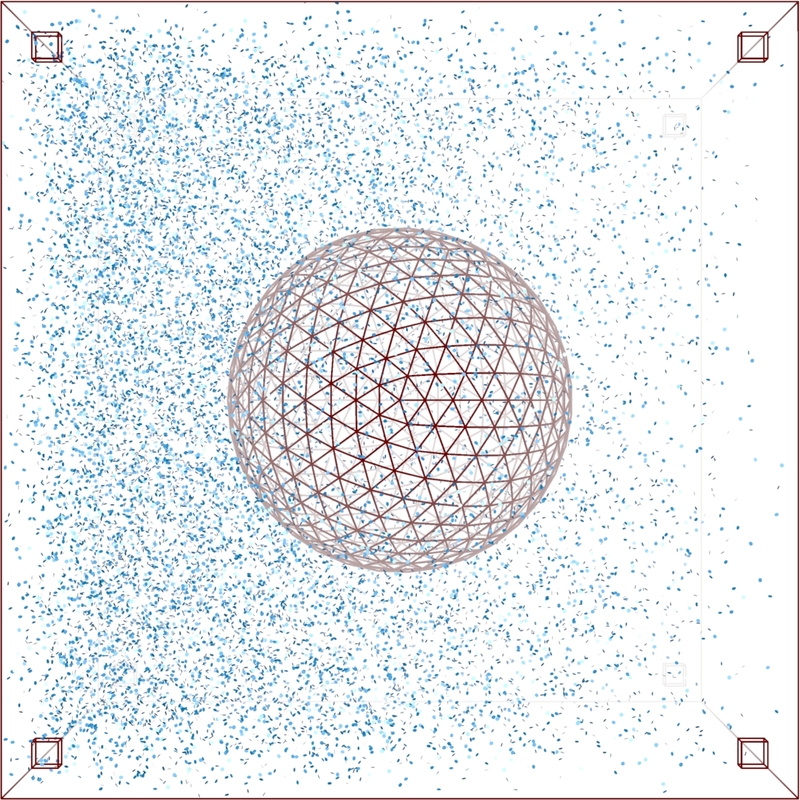 SIAM Journal on Applied Dynamical Systems 11(1):350-391, 2012. PDF. See the movies profiled on DS Web! Simulation codes are available on the Chiel Lab's github site. See also coauthor Jeff Gill's NEURON Reconstruction of Susswein et al. 2002 (on github). Hillel J. Chiel and Peter J. Thomas, ``Applied Neurodynamics: From Neural Dynamics to Neural Engineering''. Journal of Neural Engineering 2011. D. Michael Ackermann, Niloy Bhadra, Meana Gerges and Peter J. Thomas, ``Dynamics and Sensitivity Analysis of High Frequency Conduction Block". Journal of Neural Engineering 2011. 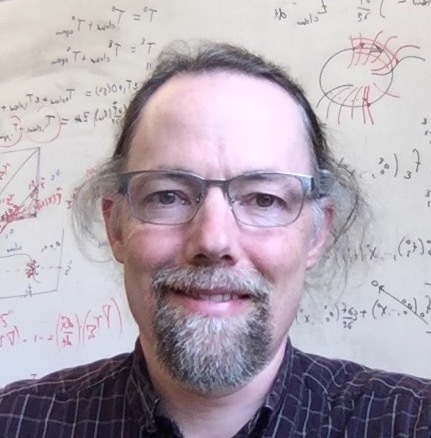 Peter J. Thomas, ``A Lower Bound	for the First Passage Time Density of the Suprathreshold Ornstein-Uhlenbeck Process". Journal of Applied Probability 48(2):420-434, June 2011. PDF. J. Vincent Toups, Jean-Marc Fellous, Peter J. Thomas, Terrence J. Sejnowski, Paul H. Tiesinga, ``Finding the event structure of neuronal spike trains''. Neural Computation, 2011 Sep;23(9):2169-208. Epub 2011 Jun 14. K.M. Stiefel, J.M. Fellous, P.J. Thomas, T.J. Sejnowski, ``Intrinsic subthreshold oscillations extend the influence of inhibitory synaptic inputs on cortical pyramidal neurons". European Journal of Neuroscience. 31(6):1019-26, March 2010. (Epub Mar 8, 2010). PDF. P.B. Kruskal*, J.J. Stanis, B.L. McNaughton, P.J. Thomas, ``A binless correlation measure reduces the variability of memory reactivation estimates", Statistics in Medicine, 26(21):3997-4008, Sep 20, 2007 (Epub June 26, 2007). PDF. J.M. Fellous, P.H.E. Tiesinga, P.J. Thomas and T.J. Sejnowski, ``Discovering Spike Patterns in Neuronal Responses'', Journal of Neuroscience, 24 (12), 2989-3001, March 24, 2004. PDF. P.J. Thomas, P.H. Tiesinga, J.M. Fellous and T.J. Sejnowski, ``Reliability and Bifurcation in Neurons Driven by Multiple Sinusoids'', Neurocomputing 52-54, 955-961, 2003. PDF. J.D. Hunter, J.G. Milton, P.J. Thomas and J.D. Cowan, ``A Resonance Effect for Neural Spike Time Reliability'', J. Neurophysiol. 80, 1427-1438, 1998. PDF. Biochemical signal transduction (two-state BIND channel, Thomas & Eckford (2016) Trans. Info. Thy.). MCell simulation of a cell in a field of signaling molecules. Top: uniform background distribution. Bottom: distribution after imposing flux conditions. Signal transduction networks are the biochemical systems by which living cells sense their environments, make and act on decisions -- all without the benefit of a nervous system. How do cells use networks of chemical reactions to process information? 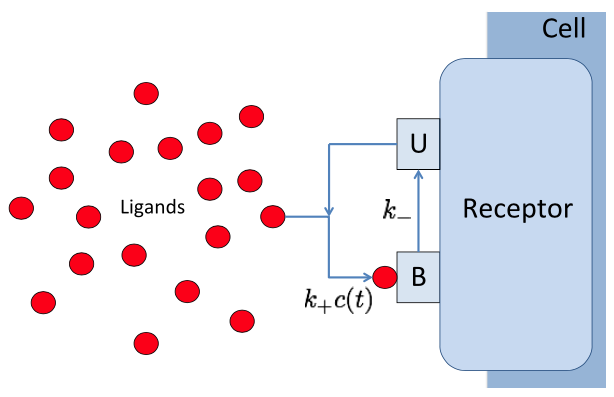 In collaboration with Prof. Andrew Eckford of York University, we are combining mathematical ideas from the theory of stochastic point processes and Brownian motion with information theory to develop a framework for understanding information processing in biochemical systems. As a case study we are studying gradient sensing in neutrophils (white blood cells) and the social amoebae (Dictyostelium) from the points of view of information theory and statistical signal detection theory. Projects range from highly theoretical (devising information measures for time varying continuous time Markov processes) to highly computational (simulation of gradient sensing networks using explicit Monte Carlo techniques such as MCell. Gradient sensing work is being pursued in collaboration with the Baskaran laboratory. Andrew W. Eckford, Benjamin Kuznets-Speck*, Michael Hinczewski, and Peter J. Thomas, ``Thermodynamic Properties of Molecular Communication'',International Society for Information Theory 2018. PDF. arXiv link. Peter J. Thomas and Andrew W. Eckford, ``Capacity of a simple intercellular signal transduction channel'', IEEE Transactions on Information Theory (2016). PDF. 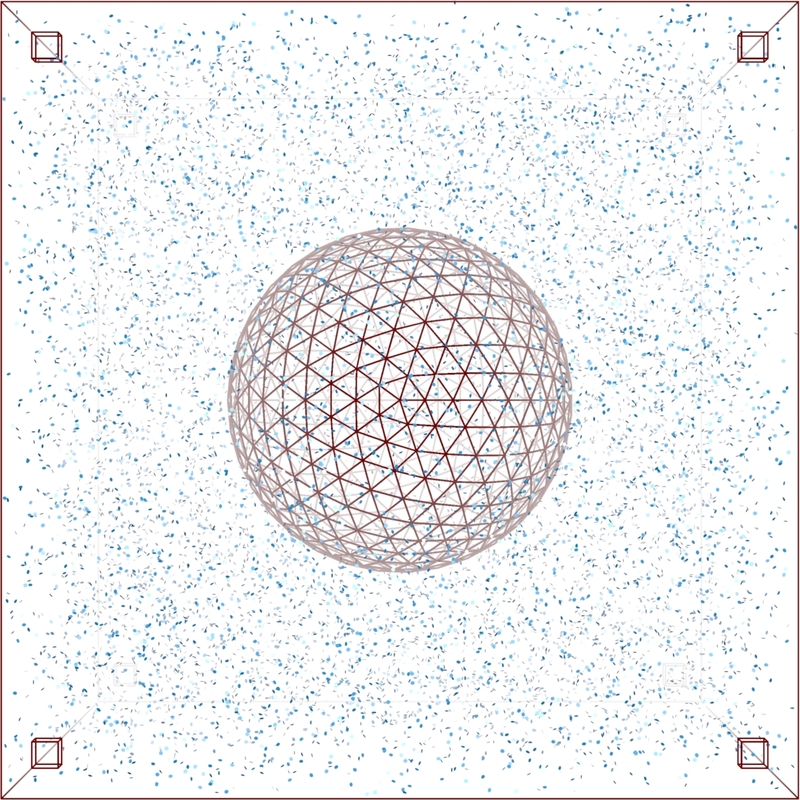 Simulation codes are available on Andrew Eckford's Github page. Peter J. Thomas and Andrew W. Eckford, ``Shannon Capacity of Signal Transduction for Multiple Independent Receptors'', International Society for Information Theory 2016. PDF. arXiv link. Andrew W. Eckford, Kenneth A. Loparo, and Peter J. Thomas, ``Finite-State Channel Models for Signal Transduction in Neural Systems'', 2016 IEEE International Conference on Acoustics, Speech and Signal Processing. PDF. Andrew W. Eckford and Peter J. Thomas, ``Information Theory of Intercellular Signal Transduction'', 2015 49th Asilomar Conference on Signals, Systems and Computers. PDF. Peter J. Thomas and Andrew W. Eckford, ``Capacity of a Simple Intercellular Signal Transduction Channel'', submitted 2014. arXiv. Andrew W. Eckford and Peter J. Thomas, ``Capacity of a Simple Intercellular Signal Transduction Channel'', International Society for Information Theory 2013. PDF. Edward K. Agarwala*, Hillel J. Chiel, Peter J. Thomas, ``Pursuit of Food versus Pursuit of Information in Markov Chain Models of a Perception-Action Loop''. Journal of Theoretical Biology, in press 2012. Peter J. Thomas, ``Cell Signaling: Every Bit Counts'', Science, 334(6054), 21 October, 2011, pp:321-322. DOI: 10.1126/science.1213834. Links courtesy of Science refer service: Summary, Reprint, Full Text. J.M. Kimmel*, R. M. Salter, P.J. Thomas, ``An Information Theoretic Framework for Eukaryotic Gradient Sensing", Advances in Neural Information Processing Systems 19, MIT Press, pp 705-712, 2007. PDF and Supplementary Materials. P.J. Thomas, D.J. Spencer, S.K. Hampton*, P. Park* and J. Zurkus, ``The Diffusion-Limited Biochemical Signal-Relay Channel'', Advances in Neural Information Processing Systems 16, MIT Press, 2004. PDF. W.J. Rappel, P.J. Thomas, H. Levine and W.F. Loomis, ``Establishing Direction during Chemotaxis in Eukaryotic Cells'', Biophysical Journal 83, 1361-1367, September 2002. PDF. An Erdos-Renyi network with 50 nodes, connection probability 0.5, and nodes labelled '1' (black) or '0' (gray) with equal probability. Distribution of edge importance measure (Schmidt and Thomas 2014). Mathematical models of cellular physiological mechanisms often involve random walks on graphs representing transitions within networks of functional states. Schmandt and GalÃƒÂ¡n recently introduced a novel stochastic shielding approximation as a fast, accurate method for generating approximate sample paths from a finite state Markov process in which only a subset of states are observable. For example, in ion-channel models, such as the Hodgkin-Huxley or other conductance-based neural models, a nerve cell has a population of ion channels whose states comprise the nodes of a graph, only some of which allow a transmembrane current to pass. The stochastic shielding approximation consists of neglecting fluctuations in the dynamics associated with edges in the graph not directly affecting the observable states. In Schmidt and Thomas 2014 we consider the problem of finding the optimal complexity reducing mapping from a stochastic process on a graph to an approximate process on a smaller sample space, as determined by the choice of a particular linear measurement functional on the graph. The partitioning of ion-channel states into conducting versus nonconducting states provides a case in point. In addition to establishing that Schmandt and GalÃƒÂ¡nÃ¢Â€Â™s approximation is in fact optimal in a specific sense, we use recent results from random matrix theory to provide heuristic error estimates for the accuracy of the stochastic shielding approximation for an ensemble of random graphs. Moreover, we provide a novel quantitative measure of the contribution of individual transitions within the reaction graph to the accuracy of the approximate process. In collaboration with Alan Lerner, director of the Brain Health and Memory Center at CWRU, and Prof. Wojbor Woyczynski we have also applied elementary graph theoretic measures to the analysis of word association networks used as diagnostic tools related to Alzheimer's Disease and other cognitive impairments. Deena R. Schmidt, Roberto F. GalÃ¡n, and Peter J. Thomas, ``Stochastic shielding and edge importance for Markov chains with timescale separation'' PLoS computational biology 14 (6), e1006206. Open Access at PLoS. Meyer DJ*, Messer J*, Singh T*, Thomas PJ, Woyczynski WA, Kaye J, Lerner AJ, ``Random local temporal structure of category fluency responses.'' J Comput Neurosci. 2011 Jul 8. Pubmed. PDF. Lerner AJ, Ogrocki PK, Thomas PJ. ``Network graph analysis of category fluency testing.'' Cogn Behav Neurol. 2009 Mar;22(1):45-52. Pubmed. PDF. Monte Carlo sampling of the Heisenberg XY Model with (+) center (-) surround lateral interaction. Color represents preferred orientation angle (Thomas 2000, thesis). Bifurcation planform corresponding to a predicted spontaneous hallucination pattern (Bressloff et al 2001A). The pathway from the eyes to the visual cortex organizes spontaneously during development using a combination of intrinsic chemical markers and correlation-based, activity-dependent (``Hebbian") mechanisms. The resulting cortical architecture shows fascinating quasiregular patterns with elements including pinwheel and other phase singularity lattices in the cortical maps representing orientation, ocular dominance, retinotopic position and other features of the visual world. Using methods from equivariant bifurcation theory -- the study of branching solutions in the presence of symmetry -- an elegant theory has been developed that accounts for many aspects of the structure of cortical maps. The same mathematical structure underlies the forms of geometric visual hallucinations reported by subjects experiencing sensory deprivation or treatment with mescal, cannabis and other hallucinogens. Paul C. Bressloff, Bard Ermentrout, Olivier Faugeras, and Peter J. Thomas. ``Stochastic Network Models in Neuroscience: A Festschrift for Jack Cowan. Introduction to the Special Issue.'' The Journal of Mathematical Neuroscience 6, no. 1 (2016): 1-9. PDF. Peter J. Thomas, Jack D.Cowan, ``Generalized Spin Models for Coupled Cortical Feature Maps Obtained by Coarse Graining Correlation Based Synaptic Learning Rules". Journal of Mathematical Biology, 65.6-7 (2012): 1149-1186. PDF. P.J.Thomas, J.D. Cowan, ``Simultaneous constraints on pre- and post-synaptic cells couple cortical feature maps in a 2D geometric model of orientation preference'', Mathematical Medicine and Biology, 23 (2):119-138, June 2006. PDF. P.J. Thomas, J.D. Cowan, ``Symmetry induced coupling of cortical feature maps'', Physical Review Letters, 92 (18):188101, May 7, 2004. PDF. P.C. Bressloff, J.D. Cowan, M. Golubitsky, P.J. Thomas and M.C. Wiener, ``What geometric visual hallucinations tell us about the visual cortex'', Neural Computation 14, 473-491, 2002. PDF. P.C. Bressloff, J.D. Cowan, M. Golubitsky, P.J. Thomas and M.C. Wiener, ``Geometric visual hallucinations, Euclidean symmetry, and the functional architecture of striate cortex'', Phil. Trans. R. Soc. Lond. B 356, 299-330, 2001A. PDF. P.C. Bressloff, J.D. Cowan, M. Golubitsky and P.J. Thomas, ``Scalar and pseudoscalar bifurcations motivated by pattern formation on the visual cortex'', Nonlinearity. 14, 739-775, 2001B. PDF. P.J. Thomas ``Order and Disorder in Visual Cortex: Spontaneous Symmetry-Breaking and Statistical Mechanics of Pattern Formation in Vector Models of Cortical Development'', Dissertation, University of Chicago Department of Mathematics, August 2000. Anopheles mosquito, capable of transmitting malaria. Analysis of molecular diagnostic data. 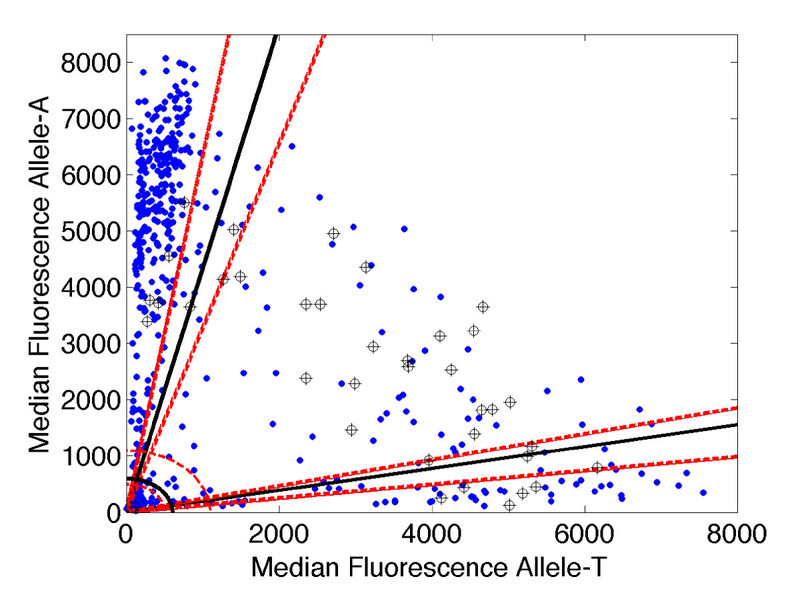 X-axis: fluorescence signal associated with drug sensitive allele. Y-axis: signal for drug resistant allele. Sloped lines: diagnostic thresholds. Molecular diagnostic technology pioneered by collaborator P. Zimmerman in CWRU's Center for Global Health and Diseases promise faster, more accurate means for tracking and combatting the spread of drug resistance in endemic malaria populations worldwide. In order to achieve their potential the new methods require novel analysis tools. Mathematical ideas as simple as coordinate transformation and histogram segmentation have proven effective in boosting the accuracy of molecular genotyping techniques for discriminating drug-sensitive from drug-resistant infections. Celine Barnadas, David Kent*, Lincoln Timinao, Jonah Iga, Laurie Gray, Peter Siba, Ivo Mueller, Peter J. Thomas, and Peter A. Zimmerman, ``A new high through-put method for simultaneous detection of mutations associated with Plasmodium vivax drug resistance in pvdhfr, dhps and mdr1 genes.'' Malaria Journal, 2011, 10(282). PDF. J.T. Da Re, D.P. Kouri*, P.A. Zimmerman, and P.J. Thomas, ``Differentiating Plasmodium falciparum alleles by transforming Cartesian X,Y data to polar coordinates'', BMC Genetics, 2010, 11:57, doi:10.1186/1471-2156-11-57. PDF. co-Principal Investigator (33% responsibility, with R. Snyder and P. Wintrode), NSF-EF 1038677. Revealing Structure via Dynamics: Biological Networks from Protein Folding to Food Webs. 9/1/2010 - 8/31/2013 $660,000. (TDC=$432,267). co-Principal Investigator (50% responsibility, with H. Chiel), NSF-DMS 1010434. 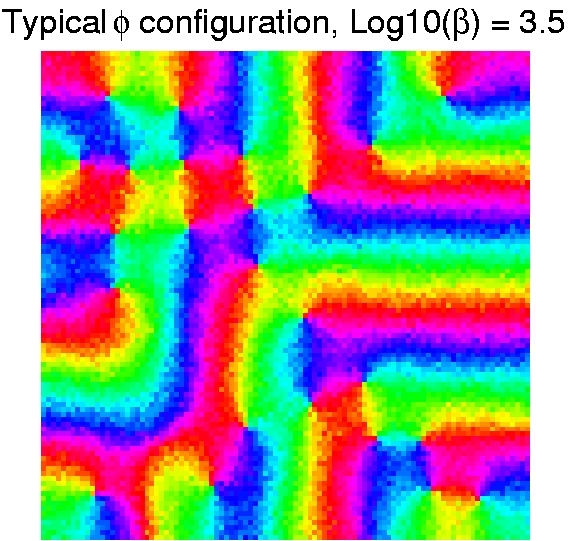 CRCNS: Robust Dynamics of a Feeding Pattern Generator. 9/1/2010 - 8/31/2013. $500,000 (TDC=$336,597). Principal Investigator (100% responsibility), Core Fulbright Scholar Program. Collaborative Investigation of the Effects of Noise on Neuronal Synchronization. 08/01/13- 12/31/13. e16,380 (approx. $22,000). Principal Investigator (100% responsibility), Simons Fellows in Mathematics Program (Sabbatical Support). Nonstationary Jump Markov Process Models for Neural Dynamics. 01/01/14-05/30/14. $72,170. Principal Investigator (100% responsibility), NSF-DMS 1413770. BIOMAPS: Spectral Analysis of Stochastic Neural Oscillators. 8/1/2014 - 7/31/2018. $230,000, plus an additional $7,000 in REU supplements. co-Principal Investigator (50% responsibility, with K. Abbott), NSF-DEB 1654989. SG: The stochastic shielding heuristic in ecological networks. 6/1/2017 - 5/30/2020. $149,923 (TDC=$96,452). 2016. Case Alumni Association. $5000 to Alexander Cao. Computational Biomathematics Laboratory personnel as of June 2018. Left to right: L. Huynh, S. Pu, N. Barendregt, P. Thomas, J. Austrow, A. Strang, and G. Hessler. Photo credit: D. Preston, Presto Photo. Casey O. Diekman (PhD 2010, Univ. Michigan; postdoctoral 2010-2013 at MBI). Currently Assistant Professor in the Department of Mathematical Sciences at New Jersey Institute of Technology. Deena R. Schmidt (PhD 2007, Cornell Univ. ; postdoctoral Sept 2011 - Dec 2014 at CWRU). Currently Assistant Professor in the Department of Mathematics and Statistics, University of Nevada, Reno. David N. Lyttle (PhD 2013, Univ. Arizona; postdoctoral 2014-2015 at CWRU). Currently Research Scientist at Accelerate Diagnostics, Tucson, Arizona. Yangyang Wang (PhD 2016, Univ. Pittsburgh; postdoctoral 2016-current at MBI). 2015-2018. Shu Wang. MS. Biology (CWRU '18). Entered MS. program in Biostatistics at Georgetown University. 2015-2017. Alexander Cao. BS/MS. Applied Mathematics (CWRU â€™17). Entered Ph.D. program in Applied Mathematics, Northwestern University. 2012-2014, 2015. Casey Bennett. BS. Physics (CWRU â€™13), MS. Applied Mathematics (CWRU â€™15). Last known employer DRW (a Chicago trading firm). 2010-2013. Young-Min Park. BS/MS. Applied Mathematics (CWRU â€™13). Entered Ph.D. program in Mathematics, University of Pittsburgh. 2008-2010. Suparat Chuechote. MS. Applied Mathematics (CWRU '10). Working in Thailand. 2007-2009. Edward K. Agarwala, MS/BS. Applied Mathematics (CWRU â€™09, â€™10). Entered industry (originally American Greetings) as a Statistical and Decision Modeling Analyst. 2007-2008. Matthew Garvey. MS. Applied Mathematics (CWRU '08). Working for CWRU/IT Services. 2006-2008. Drew P. Kouri. MS/BS. Mathematics (CWRU â€™08). Entered graduate program in Computational and Applied Mathematics, Rice University (Ph.D. 2012). As of 2017 Drew is a Senior Member of Technical Staff at Sandia National Laboratories. 2017-2018. Greg Hessler. BS. Electrical Engineering, Mathematics and Physics (CWRU '18). 2017-2018. Ben Kuznets-Speck. BS. Mathematics and Physics (CWRU '18). Winner of a Goldwater Scholarship. Co-supervised with M. Hinczewski (MH as lead supervisor). Entered Ph.D. program in Physics at Rice University. 2017-2018. Nick Barendregt. BS. Applied Mathematics (CWRU '18). Entered Ph.D. program in Applied Mathematics at University of Colorado. 2016-2017. Patrick Green. BS. Physics (CWRU â€™17). 2015-2016. Khalid "Cal" Al-Dhubaib. BS. Data Science (CWRU '16). As of 2017 Cal is a healthcare data scientist & entrepreneur, and Chief Data Scientist and Partner at Pandata LLC. 2015. Sararose "Rosie" Nassani. BS. Applied Mathematics (CWRU â€™17). Rosie entered the PhD program in applied mathematics at CWRU. 2011-2012, 2014-2015. Alexander J. White. BS. Systems Biology (CWRU â€™15). 2009-2011. David Kent. BS. Mathematics and BS. Computer Science (CWRU â€™11). Entered industry (Epic Systems Corporation). 2009-2010. Michael Steward. BS. Mathematics (CWRU â€™11). Entered Ph.D. program in Mathematics, Ohio State University. 2008-2010. Stephen J. Fleming. BS. Physics and BS. Biochemistry (CWRU â€™11). Pursued graduate study in Physics at Cambridge University and Harvard University. Winner of a Churchill Fellowship. 2008-2009. Heather McGinnis. BS. Mathematics (CWRU â€™09). 2007-2010. Bennett Rummel. BS. Biomedical Engineering (CWRU â€™10). 2007. Jocelyn E. Eckert, B.S. Systems Biology (CWRU â€™09). 2005-2006. Emily R. Miraldi. BS. Biochemistry (Oberlin College â€™06). 2012 Ph.D. in Computational and Systems Biology (MIT). As of 2017 Emily is Assistant Professor in the Department of Pediatrics, University of Cincinnati, and affiliated with the Cincinnati Children's Hospital Medical Center, where she works on systems biology, computational immunology, immuno-engineering, and network inference. 2004-2006. Peter B. Kruskal. BS. Mathematics (Oberlin College â€™06). 2013 Ph.D. in Computational Neuroscience (The University of Chicago). As of 2016 Peter is a postdoctoral fellow at Harvard University. 2004-2006. Joseph P. Kimmel. BS. Composition (Oberlin Conservatory â€™06). BS. Computer Science (Oberlin College â€™06). Entered Ph.D. program in Computational Neuroscience, The University of Chicago. 2004-2005. Andrew Bartholomew. BS. Computer Science (Oberlin College â€™06). Entered Ph.D. program in Computer Science, Brown University. Winner of a Goldwater Scholarship. For more information, please contact Dr. Thomas.